Escape to Black Bear Cabins in beautiful Cook Forest State Park! 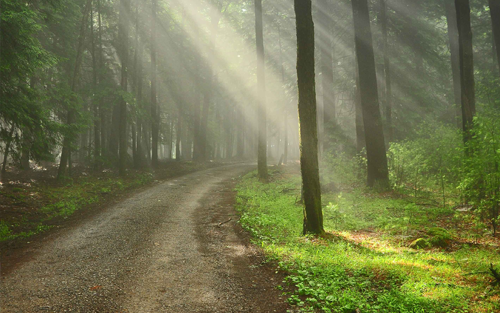 Referred to as the “Black Forest” of Pennsylvania for its towering stands of ancient growth trees, Cook Forest is known for its history of preservation and breathtaking natural beauty. 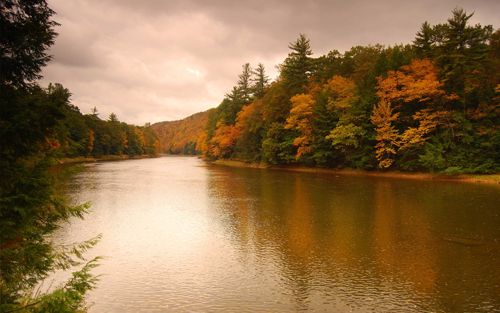 Many have long made the journey to experience its enchanting trails and float upon the sparkling waters of the wild and scenic Clarion River. Once you’ve been here, you’ll understand why others keep coming back. HIKING TRAILS One of the best ways to experience Cook Forest is by foot. Hike some of its 30 miles of trails and take in the natural beauty of an old growth forest with its hemlock and rare virgin white pine. Stop at the Park Office, located just one-fourth of a mile from the Lodge, and get a detailed trail map and suggestions from park staff. Our favorite recommendation is to hike the Longfellow trail to the Forest Cathedral, a grouping of ancient growth stands. 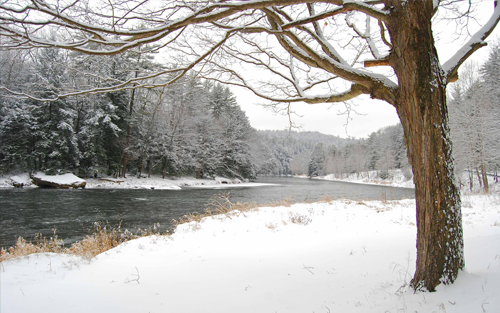 FISHING The Clarion River flows along the Park border and provides great fishing for trout, warm water game fish and panfish. The Park Office also provides a small stocked fishing pond nearby for the kids. Country Squirrel Outfitters in Ridgway offers fishing guides and rentals. CANOES, KAYAKS, INNERTUBES, PONTOONS & PADDLEBOARDS One of the best views of the forest is from the wild and scenic Clarion River. 2-Hour to Full-Day excursions are available in the Cook Forest/Clear Creek Area. Pale Whale Canoe and Cook Forest Canoe Livery are the closest to the Gateway Lodge. Please see our brochures at the Lodge for more information. HORSEBACK RIDING Ride the trails at a relaxing pace, Cook Forest’s stables offer horseback riding for all ages and experience levels. Some stables include the Flying W Ranch, Silver Stallions, and Pinecrest Stables. BUMPER BOATS, GO CARTS, & MINI GOLF Yes, Cook Forest has some fun in store for the young and young at heart. Most of these fun activities are right along Route 36. PHOTOGRAPHY Cook Forest offers plenty of beautiful scenery worthy of your “focus.” In fact, it could take weeks to fully capture the essence of Cook Forest’s wildlife, vegetation, fungi, trails, trees, rocks, and scenic vistas. Be sure to stop by the Kaltenbaugh Photography “Gallery in the Forest” to view Kevin Kaltenbaugh’s beautiful images of the forest; just minutes away from the Lodge. LOCAL ARTISAN GALLERY & SHOPS Salem Stoneware Pottery is one of our favorite places to send guests. See pottery being made first-hand by this family-run business. Tip: If Merlin is there, ask him for a magic trick. Kevin Kaltenbaugh’s "Gallery in the Forest" is another great stop. See breathtaking photography of the area and visit with Kevin personally. Kevin offers guided forest photowalks at Gateway Lodge throughout the year. Other wonderful galleries and shops include Briar Hill Furniture, Cooksburg Dry Goods, Shamrock Creations, and The Pickle Barrel. Gateway Lodge is also a Pennsylvania Wilds Artisan trailstop featuring local artwork from the PA Wilds. SAWMILL CENTER FOR THE ARTS Dedicated to preserving traditional arts and crafts, the Sawmill Center for the Arts offers art workshops and holds theatrical performances in the round throughout the summer. They also sells local artwork and crafts. FIRE TOWER & SENECA POINT OVERLOOK The 80 foot tower, built in 1929, gave firefighters a 20 mile view of the area. The tower retired from service in 1966, and now offers visitors one of the best scenic views of the forest. When you’re at the very top, try to spot the Gateway Lodge. It’s the only building in view. Also nearby is Seneca Overlook, a great grouping of rock formations with a spectacular view of the Clarion River. Visit Cook Forest’s environmental learning center. Adjacent to the Longfellow trail, it contains a variety of displays, taxidermy animals, and logging tools from early lumbering days. Learn about the efforts of Civil Conservation Corp, the largest conservation effort in American history. WINTER ACTIVITIES Cook Forest is just as beautiful in the winter as it is in other seasons (some might argue more!) The park has a lighted ice-skating pond near River Road, 10 acres of sledding slopes, and three designated cross-country ski trails with an equipment rental facility. © 2018 Black Bear Cabins, All rights reserved. | Site designed by Ernest Fesco.